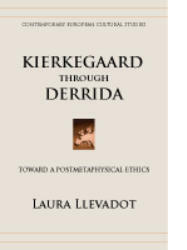 Title: Kierkegaard Through Derrida: Toward a Postmetaphysical Ethics Author: Laura Llevadot Series: Contemporary European Cultural Studies Imprint: The Davies Group, Publishers soft cover 218 pp. USD 24.00 ISBN 978-1934542323 February, 2013 What could a postmetaphysical ethics be? And why think it from the vantage point of the work of Kierkegaard and Derrida? These two questions guide this work and emerge from this initial position: a postmetaphysical ethics would move away from Heidegger’s criticism of the ethical as a practical domain separated from theoretical intellection. Heidegger sought to demonstrate that the ethical—as a specific practical domain that attempts to propose norms and rules of action and is different from the theoretical—is in itself metaphysical. Metaphysics is the distinction between the theoretical and the practical. That the divergence between the theoretical and the practical, the ideal and the real, the ontological and the ethical, ceases to be decisive signifies, above all, the toppling of the classical opposition between faith and knowledge, believing and knowing, that is, the toppling of the consequences that arose from the border that divided reason and “unreason,” philosophy and religion. In determining the extent to which the question of belief can be examined in relation to postmetaphysical ethical thought, the author argues that a postmetaphysical ethics would be one for which belief, and in particular the belief in the other, is no longer irrational waste but the Archimedean point of the emergence of the postmetaphysical ethics itself. Kierkegaard and Derrida can teach us to think the configuration of an ethics whose center is inhabited by no other duty than the impossible, aporetic, and undecidable duty to believe. Contents Foreword/Forward by Michael Marder Acknowledgments Introduction Abbreviations of Kierkegaard’s Works 1. Believing the Impossible: Kierkegaard and Derrida I Belief and the End of Metaphysics 2. God: Kierkegaard and the Death of God 3. Love Believes All Things: Kierkegaard, Deconstruction, and the End of Metaphysics 4. Silence and Justice: Why Cannot Abraham Speak? II Death 5. One’s Own Death: Kierkegaard and Heidegger 6. The Death of the Other: Kierkegaard, Levinas, Derrida III The Self and the Other 7. You: Kierkegaard’s “Second Ethics” Beyond Buber and Levinas 8. Making Truth: The “I” of Confession in Kierkegaard and Derrida Appendix: The Suspension of the Ethical in Breaking the Waves: Kierkegaard and Lars von Trier Notes Reviews “ Kierkegaard through Derrida is an original work that addresses some of the key issues in modern philosophical thinking. Most previous studies on Kierkegaard and Derrida have focused primarily on the notion of a deconstructive theology; Llevadot’s study breaks new ground by applying some of the results of these previous studies to the question of ethics. The work is divided into three main sections, which treat in turn the status of belief in the context of the end of metaphysics, the modern understanding of death in the existentialist and postmodernist traditions, and the possibility of postmetaphysical ethics. This highly readable work will be of great interest to anyone interested in Continental philosophy.” — Jon Stewart Søren Kierkegaard Research Centre, University of Copenhagen “The challenge of philosophy today is to allow this silence to speak without breaking it, without inscribing it in the logic of the voice, without merely thematizing or making explicit something that has been hitherto hidden. In Kierkegaard through Derrida , Llevadot takes up the challenge in her own style, by formulating postmetaphysical ethics and philosophy without formalizing them. And she does so in a singular manner, with recourse to a singular dialogue between two philosophical singularities.” — Michael Marder Ikerbasque Research Professor of Philosophy, University of the Basque Country The Author Laura Llevadot (Ph. D. in Philosophy, University of Barcelona, 2006) is Professor of Contemporary Philosophy at the University of Barcelona, where she teaches courses on Post- structuralism and Deconstruction. She is a member of the Laboratoire d’Études des Logiques Contemporaines (Paris). Among her many publications are La philosophie seconde de Kierkegaard (L’Harmattan, 2012), Philosophy in the forth-coming University with Manuel Cruz (2013), and Postmetaphysics Philosophy. 20 years of French Philosophy with Jordi Riba (2012).